Following this question, I have a problem. the multi-thread works fine, if I don't update the same entity in different threads. Regarding the image, I have a thread that inserts objects into "MemberAd" Entity. By the same time, the entity "MemberContacts" is being inserted with objects, several for each Member. The thread that inserts objects into "MemberAd" finished first than the other one. When the thread of "MemberContacts" end working, and saves the changes, these ones are not saved. 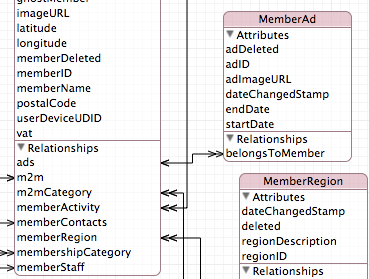 I think it's because I've saved the "MemberAd" changes while the "MemberContacts" data was being inserted. Browse other questions tagged iphone ios multithreading core-data or ask your own question.